Teatro Vivo Produces La Pastorela: A Bilingual Comedy The Whole Family Can Enjoy. 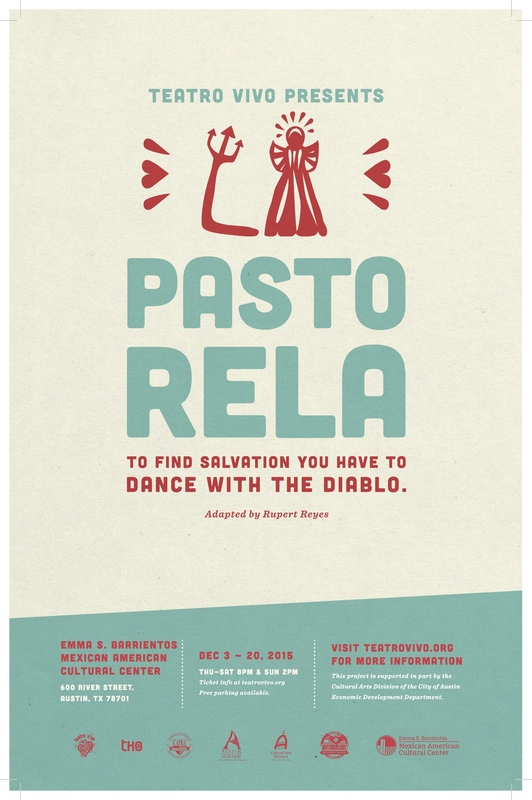 AUSTIN, Texas — Teatro Vivo presents “La Pastorela” December 3 through 20, Thursdays through Saturdays at 8 p.m. and Sundays at 2 p.m. at the Emma S.Barrientos Mexican American Cultural Center located at 600 River Street in Austin, Texas. The traditional play, an adaptation by Rupert Reyes, is centered around the pastores (shepherds) as they traveled to Bethlehem in order to witness the birth of Jesus. Pastorelas are one of the oldest and most enduring Christmas traditions in Mexico. Originally, the Mexican Pastorela was a religious theater created for the purpose of converting “heathen native.” Once appropriated by popular theater, it was never the same. Pastorelas take many forms and are vigorously influenced by invention and improvisation from the talent participating. Pastorelas may be religious, folk drama, theater, or even urban folk drama, but a very particular structure is maintained. The bilingual play resonates with both Spanish and English speaking audience members and incorporates traditional music and dance from various regions of Mexico. This production is an entertaining way the whole family can enjoy this Christmas classic. Admission is $15 for general public and $20 for reserved seating. Teatro Vivo offers student, senior and teacher discounts for $12. Opening Night, Thursday, December 3, is free admission to the public courtesy of the Emma S. Barrientos Mexican American Cultural Center. Attendees should sign up online at http://pastorela.bpt.me to secure a free ticket. Thursday, December 10 and 17 are “pay what you wish” one hour before the performance time. A Vino y Chocolate reception will take place Friday, December 4 from 6 to 7:30 p.m. and will include donated local pastries and complimentary wines for attendees to enjoy before doors open. for the festival are a donation-based or “pay what you wish.” A $40 reserved seat festival pass is available for those attending all three days or reserved seats may be purchased for $15 for each play. Furthermore, Teatro Vivo is offering a limited number of complimentary “social media” seats at the back of the theatre for those interested in live tweeting and posting to social media during the festival. Visit teatrovivo.org for information. Playwright: Andrew A. Valdez is an undergraduate student at the University of Texas at Austin. His most recentwritten works include The Rainbow Connection, which debuted at the Cohen New Works Festival, and Basilica,which was presented by Teatro Vivo. Playwright: Krysta Gonzales is an actor/dancer/performance artist/writer originally from El Paso and Dallas. She earned her BFA from NYU’s Tisch School of the Arts, Experimental Theatre Wing and is currently an active member of the Vortex Repertory Company and the Generic Ensemble Company (GenEnCo). She was most recently onstage as Dunia in Teatro Vivo’s production of El Nogalar and her first play, Robin Hood: An Elegy, a devised collaboration with GenEnCo, premiered at the Vortex in August 2015. Synopsis: Two teenaged Latina cousins, Araceli and Julie, have come to the US at different points in their young lives. Both girls work through the struggles of living on the hyphen known by many Mexican Americans, including their language, traditions, nationality, and identity. The play asks various questions including the following: What does having a quinceañera mean to Mexican American girls given varied connections to their roots? How can anyone retrace their roots and remember and re-establish who they are? How might these primas influence one another to live on the hyphen with more courage, consciousness and grace? for several years and served as Artistic Director of Teatro Humanidad in Austin. As well as her playwriting, she is also a director and performer. Festival at WMU (under the previous title “Spin”). That play led to a residency with UMS (2014-2015), a residency with Djerassi, an upcoming Mitten Lab Residency and an upcoming commission with Milagro Theatre in Portland, Oregon. Emilio currently teaches theatre with such companies as Matrix, Living Arts, and the Wharton.